Our Sammic Scholars Ruth and Elisha finished their BasqueStage experience at the end of June. It was full of action, from the three star kitchens of Martín Berasategui to the tiny creameries in the hills of Basque Country. 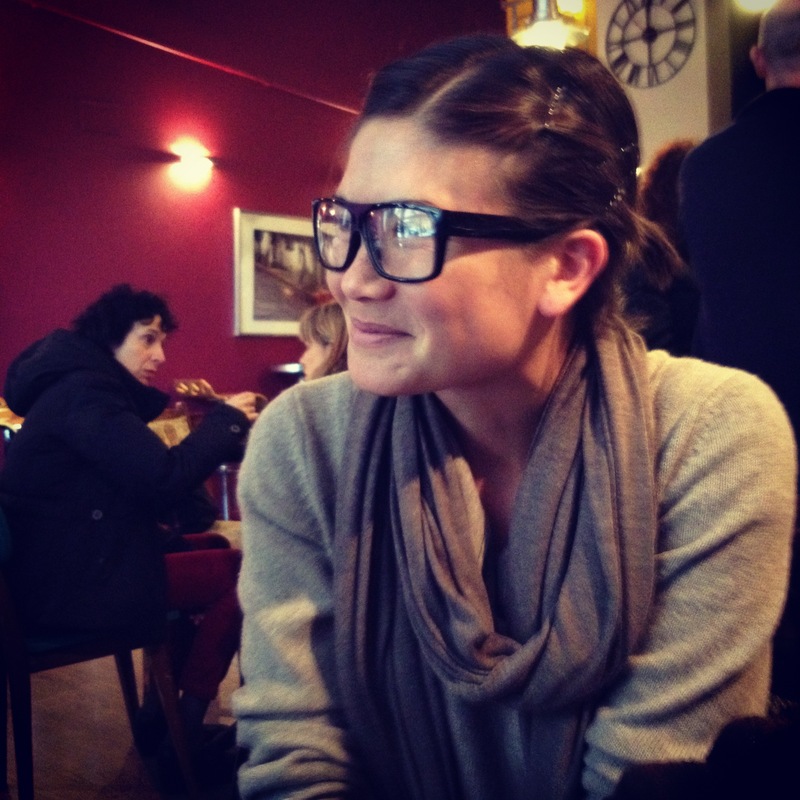 We’ve invited Ruth to the blog to share her closing words before we welcome our new scholars, Luuk and Brenden. After six months of living in Pais Vasco, the time has come for me to return to California. I go with excitement, ready to start in earnest my cooking career. I also go with a twinge of sadness, because my time here has been so rewarding. From a three Michelin starred kitchen to a pintxos bar, from a cheese maker to cooking classes in gastronomic societies: we’ve seen almost every facet of Basque food culture. I know how to work in a stressful, demanding kitchen. I also learned how to operate some of the best kitchen equipment in the business. In terms of palate, I can now taste the nuances between different Idiazabals. I learned how to make blood sausage with an elegant senora who has been making sausage her whole life. I picked sweet peas, lettuces and edible flowers in a hilltop garden in Getaria. Most importantly, I’ve met motivated, talented and generous people who value food and celebrate it in ways I admire. Thank you for welcoming me and teaching me. California, I’m coming home. But Euskadi- I’ll be back as soon as I can! Today and tomorrow are the last days to apply for the IV Sammic Scholarship for BasqueStage. That still leaves you time to get your application in for consideration. Maybe you’re still on the fence. Perhaps you aren’t sure what kind of person is BasqueStage material. One way to get the answer to that question is to visit our former and current stages’ blogs. We’ve asked our current stages, Elisha Ben-haim and Ruth Selby to give us what they think are the top qualities that a future stage should have. Read on and then get in your application! Be thick-skinned. “This is a very old school kitchen,” adds Elisha. Have a good attitude. “Both in the kitchen and out, you should want to get out, see and learn as much as you can while here,” adds Elisha. Bring your knives-sharpened. “I’ve realized what a great knife culture we have in kitchens in the US. Some people here don’t even have their own knives. You do yourself a big favor if you come with quality knives, ready to rock,” Ruth adds. Have patience and be humble. 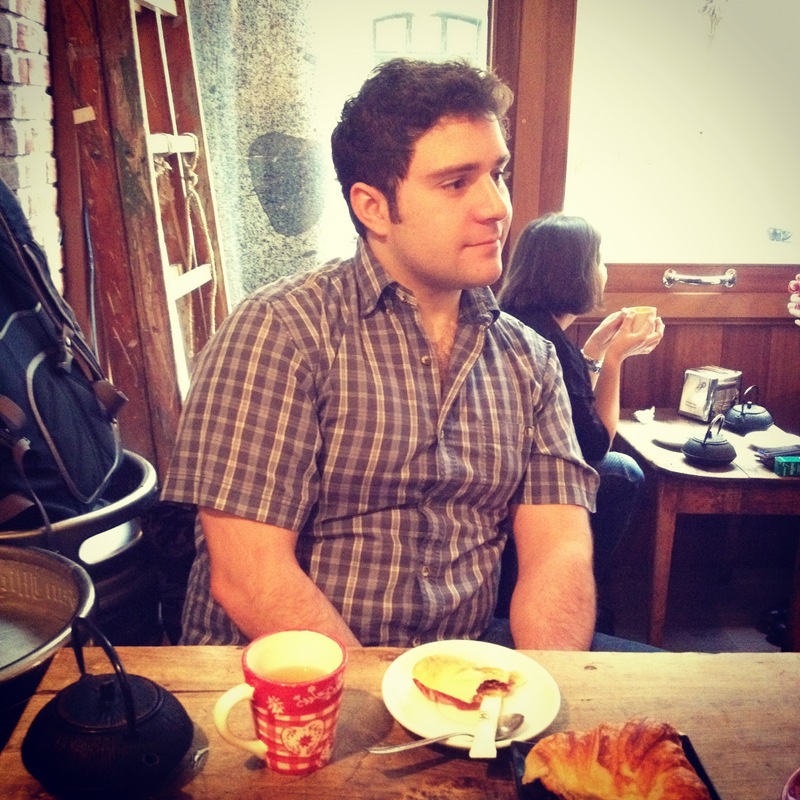 “It can be frustrating, humbling and occasionally infuriating to work in any kitchen, and this kitchen is no different. I remind myself how much I’m learning every day, and how fortunate I am to be here,” says Ruth. It’s March. That means it’s calçot season. 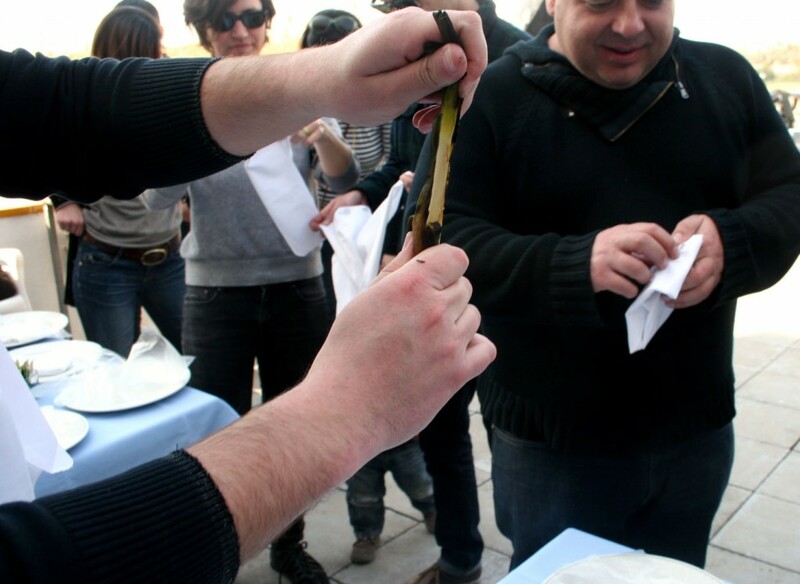 What’s a calçot, you ask? It’s perhaps Spain’s most famous onion, and it’s so revered in northeast Spain (Cataluña) that it has a whole season of parties that revolve around it. So of course we had to carry our Sammic scholars to experience it firsthand. 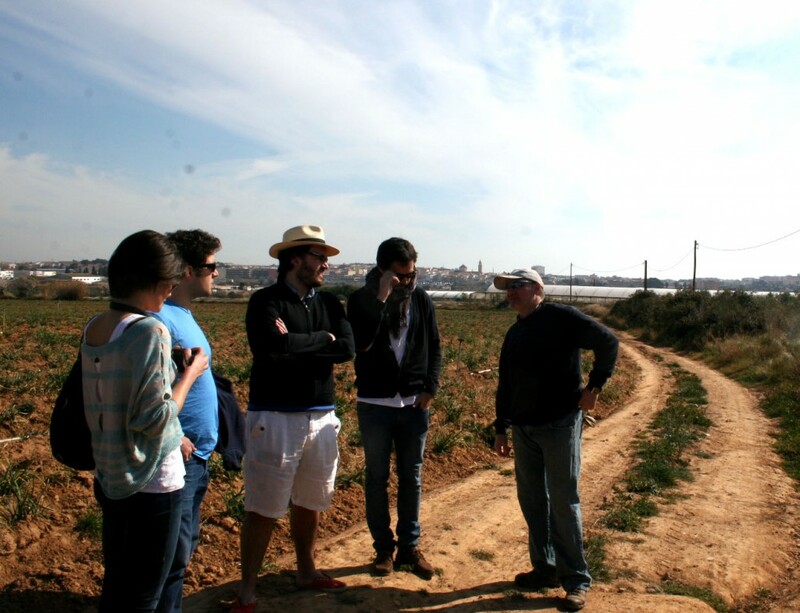 We visited a family farm, the Brothers Blanch, and one of its owners explained us the abc’s of calçots. 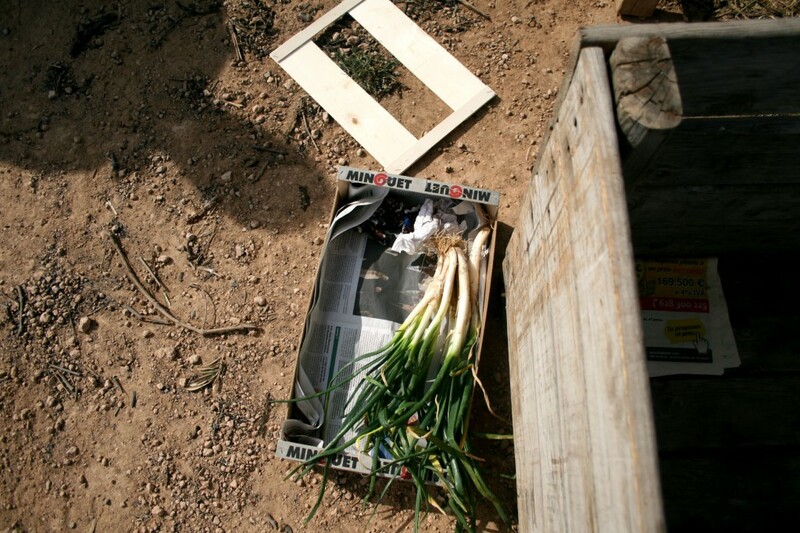 Specifically, a calçot is an onion that has been taken out of the land, allowed to sprout (like they do when you leave them too long in the pantry), then returned to the ground. Farmers, like the one above, carefully pile dirt for weeks until the sprouts become full-size onions that look more like leeks, with long, white stems. Then they are harvested, and it’s the moment of truth. The calcots are charred over a huge, open flame, then wrapped quickly in newspaper. This makes for easy transport and also serves to steam them to perfect tenderness. Why? Because they will then be served by the plateful, adorned with large bowls of sauce. Romesco sauce just happens to be the eighth wonder of the world: a rich, bright sauce of nuts, red peppers, the dried ñora chile, tomato, olive oil, a splash of vinegar and some kind of stale bread product. The charred calcots are then slipped free of their skins and…devoured. This peeling is a really, really messy business. Imagine flakes of charred vegetable flying everywhere…on clothes, on bibs, on the table. At least there’s plenty of wine in the porrón to go around. You could say that Elisha more or less got the hang of it. Last week we had our first (un)official BasqueStage dinner catered by our new stages, Ruth and Elisha. So what did they cook for us? Well, it was not a reflection of any molecular funny business. Just some professional takes on good old-fashioned home cooking. 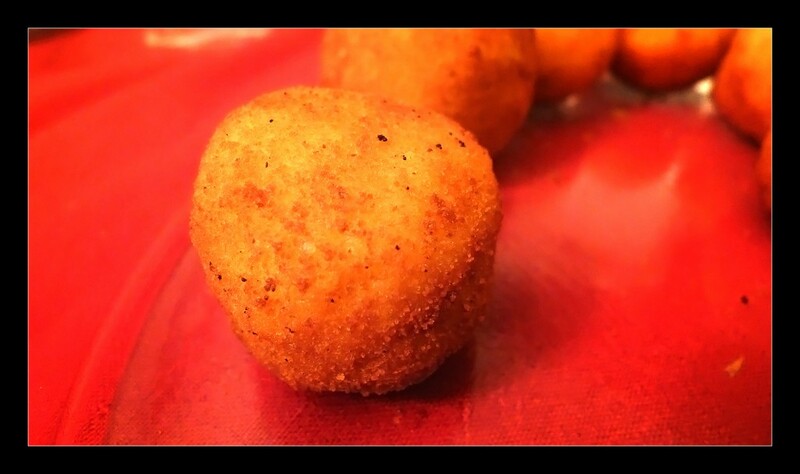 VERDICT: These little rice balls, which can enclose anything from meat to cheese to peas, are the Italian’s answer to croquetas. Ruth’s version held a filling of juicy meat, and was quite the revelation for our Spanish guests, who all their lives have bitten into similar fried balls filled not with rice, but bechamel. Ruth’s orange, meat filled versions were a party hit. VERDICT: Oso gozoa! That is to say, really delicious (in Basque). 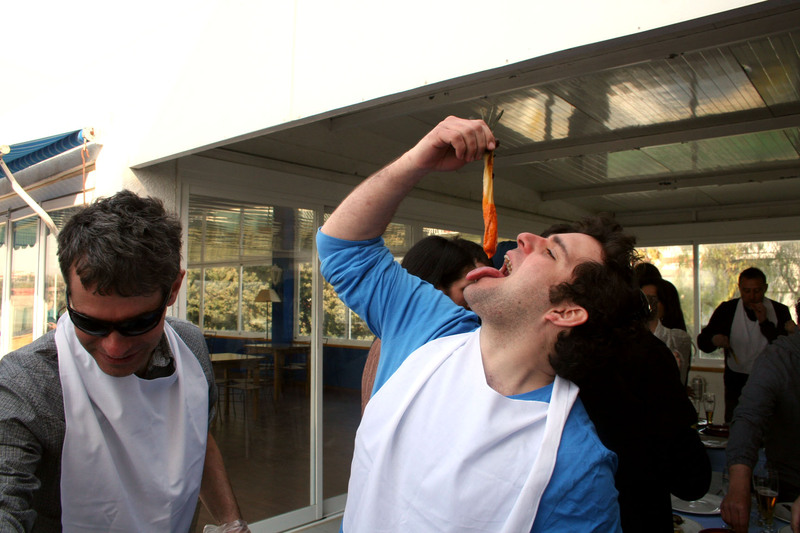 Elisha gave his piperade, a traditional Basque dish of onions, peppers and tomato, the special treatment. Peppers, thinly sliced, were allowed to slowly cook for hours with a lovingly made sofrito of onion and tomato. 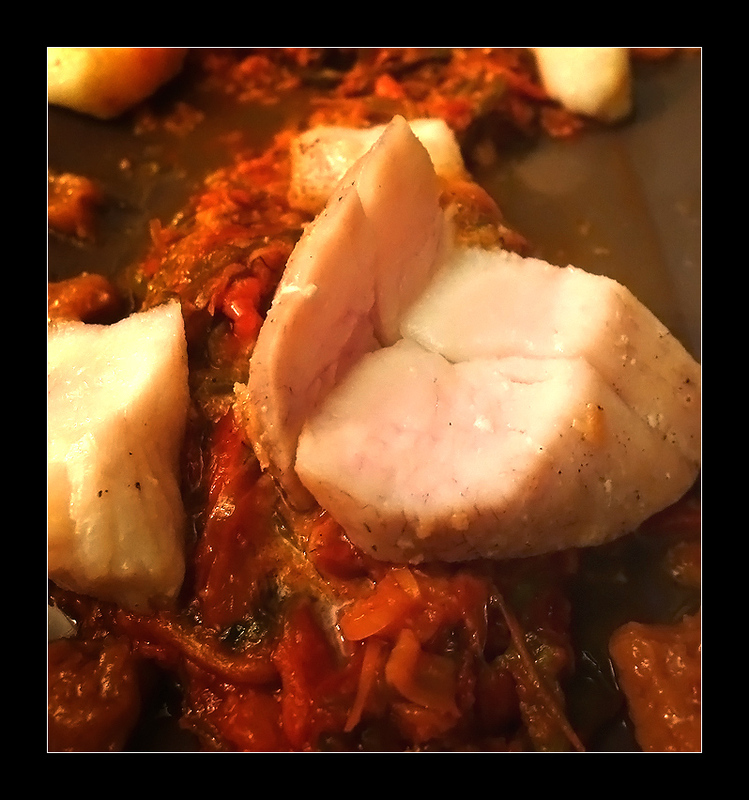 Topped with some perfectly tender monkfish, this dish was delicious by the spoonful, dragged through dollops of roasted garlic on the way to the mouth. Ñam ñam! Thanks, and on egin! Here’s to many more dinners from our star chefs-in-training. 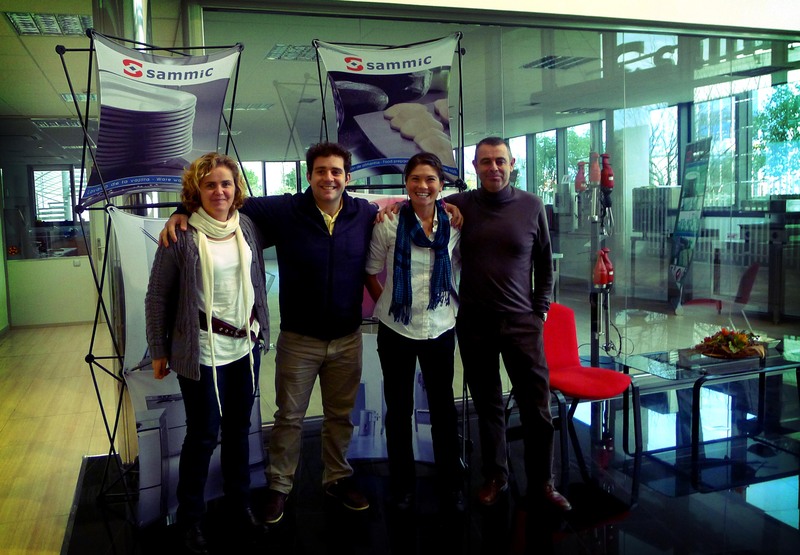 This week, Ruth and Elisha met all the gang behind Sammic, the company that has sponsored this and the previous two rounds of scholars for BasqueStage. We headed out to their headquarters in Azkoitia, about forty-five minutes from San Sebastián. There, Ruth and Elisha got the red carpet rolled out for them. They had tour of the factory, where nearly all the goods Sammic sells are produced. The beautiful part is that they are produced by people from the town, often people that have generational ties with the company. 90% of the workers have a share in the company, a remarkable number. Ruth and Elisha thoroughly enjoyed meeting the people who are working to further the future of Basque cuisine, by bringing young chefs to the Basque country to learn from the best. Quality is key in the Basque cuisine, right up there next to authenticity. Something that our stages learn every day, even on the days they aren’t in the kitchen. That’s our Ruth, one of our two brand new Sammic Scholars for BasqueStage. And whatever you do, don’t call her a tourist. Elisha and Ruth are buried in the kitchen at Berasategui, and every weekend they surface to see some of the surrounding beauty, experiencing it as only a local can…in car, winding through the picturesque mountains. This weekend, we went to visit the Sammic factory in Azkoitia, but before we get to that, we have to talk about….what we ate on the way. Clearly. 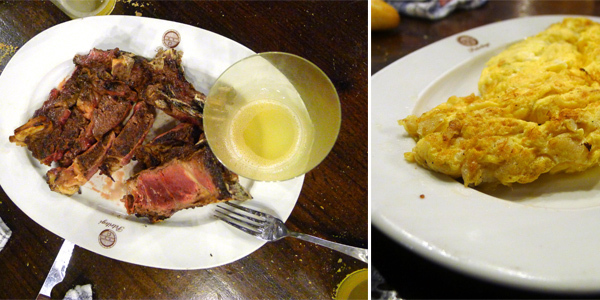 We stopped at a SERIOUSLY rural restaurant, and we got the traditional Basque treatment. A bowl of free soup to knock the chill. 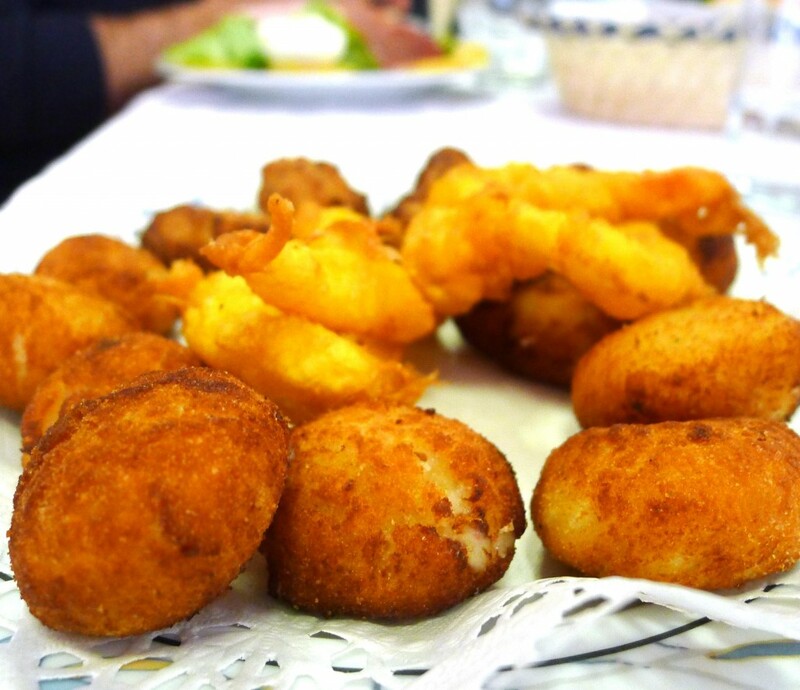 A choice of first course: mixed salad, ensalada rusa, fried things (above, croquetas and calamari)…and then seconds: roast beef, roast chicken, sole with a hard-boiled egg sauce…. followed by dessert of natillas, arroz con leche, and coffee. All next to a crackling fire. Stay tuned for the Sammic visit! This weekend our new stages, Ruth and Elisha, indulged in a quasi-mandatory Basque winter tradition: a ciderhouse visit. 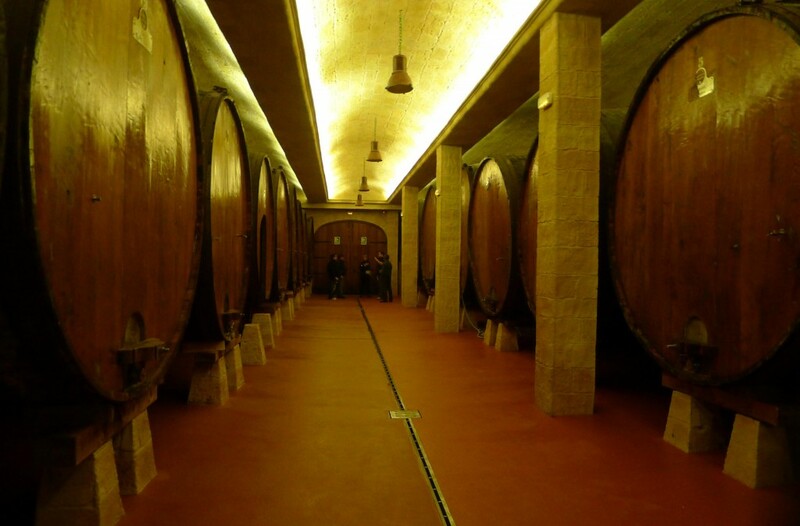 Hop a bus to Astigarraga, a nearby town whose ciderhouses gained fame late last century. It was once a totally homemade endeavour, in which friends invited friends to have some cider and, hey, use our grill if you BYOM (Bring Your Own Meat). Now, it’s more commercial, but also more available to the general public to enjoy. For a fixed price, you enjoy a typical cider house menu: a cod tortilla, bacalao with peppers and onions, and a big, juicy steak. Dessert is walnuts, Idiazabal cheese, and membrillo, or quince paste. The same year after year, from one cider house to another. And finally, most importantly, you are allowed unlimited access to the cider barrels. 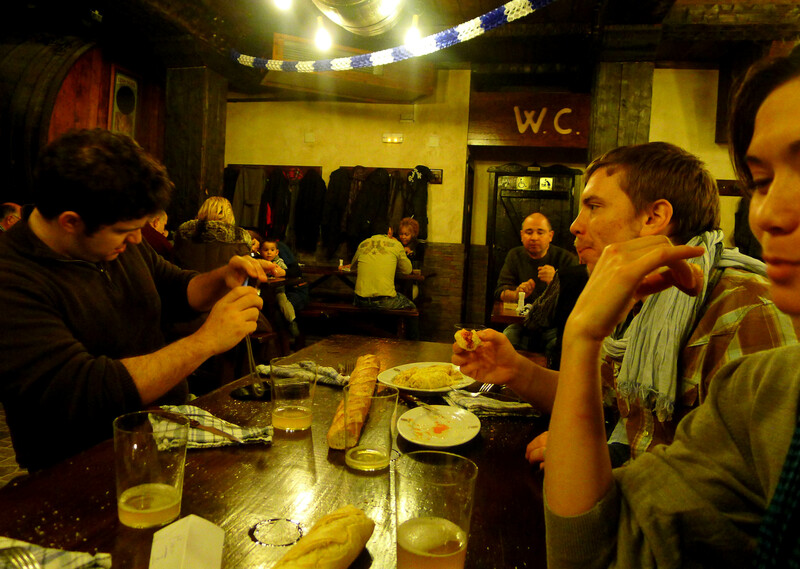 Basque cider differs greatly from its French, British and American counterparts. Made from fermented apples, it’s drunk in the year it’s made. It’s not sweet, and it can be very acidic…and always with a signature deep yellow color. It’s hard to imagine a place with more conviviality at the table. Cold mountains outside, warm steak and biting cider around a wooden table inside. The III Sammic Scholarship for BasqueStage has officially begun. 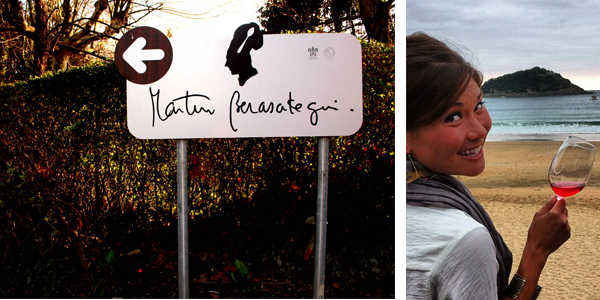 Ruth Selby and Elisha Ben-Haim entered the ktichen of Restaurant Martín Berasategui this weekend, for their first introduction to 3-star Michelin kitchen life. These two cooks came to Basque Country from New York, where hours are long, kitchens are tiny, and hands are kept to a minimum. So how are they adjusting to a kitchen staffed with stagieres? “There is always someone to ask if you need a hand with a task, or if you don’t know where something is,” comments Ruth on the strength of numbers. Ruth has started her adventure on the fish station, learning to love the delicate and demanding squid ink ravioli. Our new stages have finally arrived. The next six months will be filled with adventure, officially starting next week, during their first day at Martín Berasategui. It’s easy to keep up with them, via social media, and to make it even easier, we have compiled all relevant links for Ruth and Elisha below (along with pictures capturing that first-day-in-San-Sebastián twinkle in their eyes). 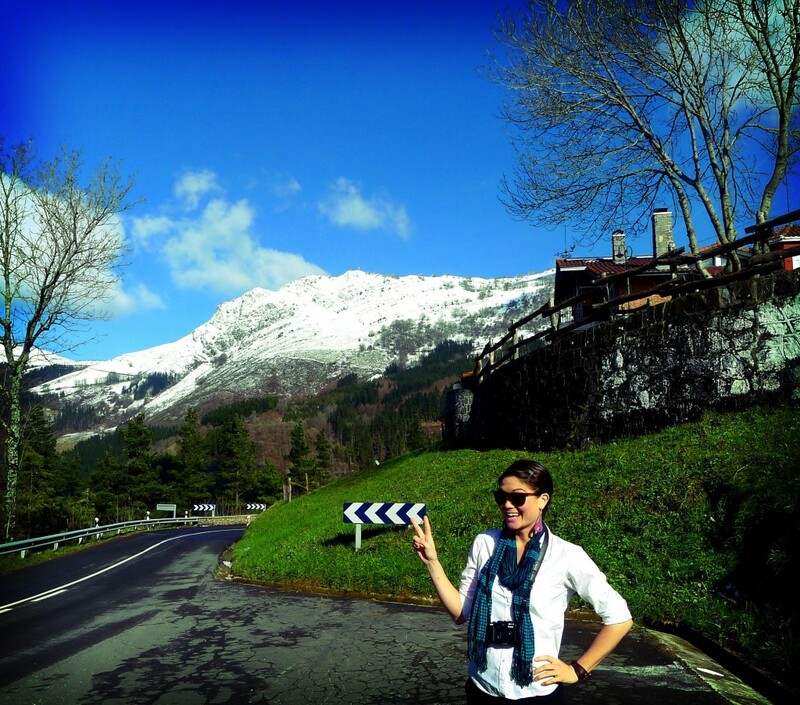 Follow them on Twitter, bookmark their blogs, and get ready for a wild ride as these two New Yorkers (via Cali and Israel) discover Basque Country.